If you’ve been following along with us on Instagram it’s pretty clear that we are “home” now. We arrived in Casar, NC in mid-December, low-on-funds, tired, cold, and eternally grateful for 2015 on the road. We loved it. It wasn’t always easy and certainly there were some surprises but it was everything we’d hoped and planned for. And so much more. I suppose with the start of this new year I’m officially unemployed. I’ve begun my job search knowing that it will take some time to find the right professional fit. Jessie has the good fortune of being highly employable and began an open-ended/temporary position in her medical field in Shelby, NC. This should allow us to continue to eat, pay bills, and give us some flexibility moving forward. I have been spending a significant amount of time at the local YMCA training for my upcoming triathlon season. It’s been good to get back into workout routine. I’m officially in the best “winter shape” of my life. I guess that is the major plus of being without work. If I can avoid injury I’m hoping for my best season yet. I plan to cap it off with Ironman North Carolina. Problem is the entry fee is $715. Yep. You read that right. So I’m in the process of trying to justify that expense while I’m out of work all for the privilege of propelling myself through 140.6 miles of pain. When not at the Y I’m spending time at the county library where internet is slightly faster and more reliable than the satellite internet at my in-laws. Being “home” has been more challenging than we anticipated. The holidays were great but now that Jessie is back to work and I’m working hard on finding meaningful employment we feel greatly unsettled. Much more so than at any point last year. This is counterintuitive to us. We almost never knew where we were headed next in 2015. We frequently started the day not knowing where we’d sleep. Yet now that we are somewhere familiar and have more of a routine we feel out-of-sorts. Perhaps this is/was to be expected. We underestimated it. That said we are happy to be home. Catching up with family and friends has been wonderful and while we ate well on the road, nothing can beat home cooking. On day four (of seven) of our time in North Cascades National Park, we picked up* the two smelliest individuals we’ve ever met. These chaps were from Wales and were ten weeks into a twelve week backpacking adventure in the western US. I’m not sure they’d bathed since arriving. Jessie had a very polite and seemingly delightful conversation with them as I drove as fast as was prudent with my head out the window (perhaps a slight exaggeration, but you get the idea). About 30 minutes later, we parted ways with our foul but enjoyable new acquaintances and were on our way to Mt. Baker National Forest and Recreation Area. We’d decided to leave North Cascades National Park for the day for less smoky hiking conditions after winds shifted overnight and sent a lot of smoke our way. You see, there were three separate wildfires burning in the southern part of the park. Not that these fires made CNN headlines like the Glacier NP fire with all of its fancy video footage and road closures. North Cascades is the second least visited National Park in the lower 48, so it isn’t exactly newsworthy the way the more popular parks are. Mt. 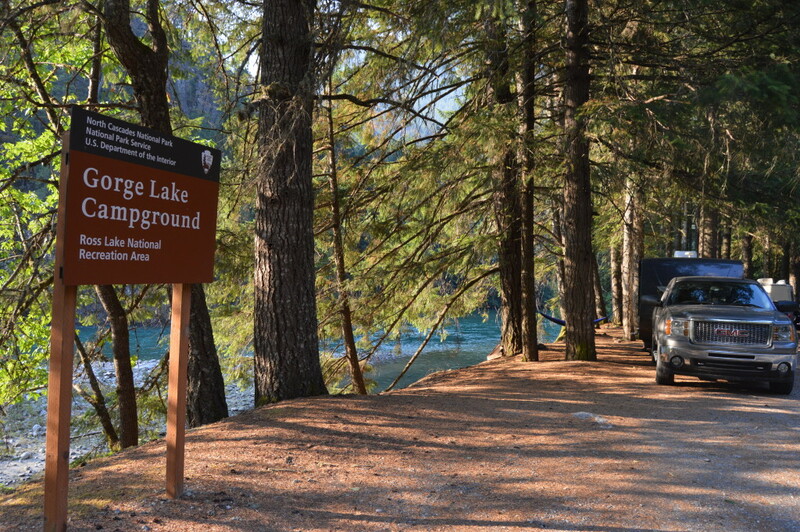 Baker National Forest is located about 40 miles west of North Cascades. During the winter of ’98-’99 Mt. Baker received a world record 95 feet of snow. 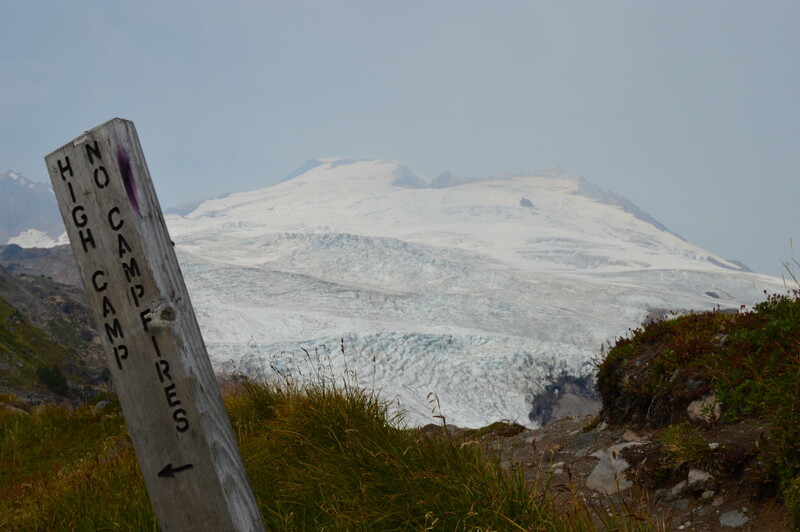 It boasts a peak just under 11,000 feet and seven massive glaciers. 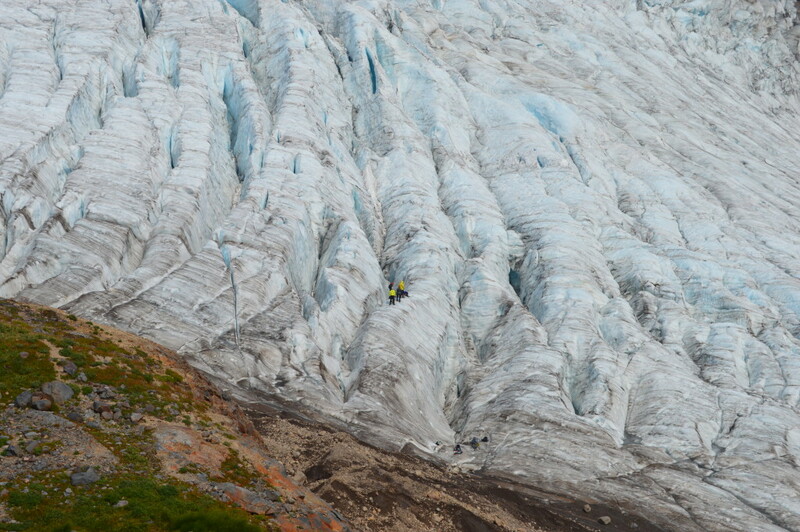 The glaciers were the big draw for us, so after winding up 15 or so miles of dirt road we arrived at the Mt. Baker National Recreation Area Trailhead. As we pulled into the small gravel parking lot, we saw two guys hiking into the wilderness with skis. I looked at Jessie and said, “I think we might be in over our heads”. But we decided to press on, determined to get in some hiking. Up we went through alpine forests and boulder fields, across streams and waterfalls until the Easton and Squak Glaciers appeared before us. As we arrived at the fork in the trail where we had to commit to a route for the day, we came upon a lovely French-Canadian gentlemen who recommended one of the two trails we were considering. So we skipped the more popular Park Butte trail with its smoke-limited panoramas in favor of Railroad Grade, which promised an up-close-and-personal view of Mt. Baker. It did not disappoint. This hike is easily in the top ten for the year. While at North Cascades, we learned the park is really about three things: (1) amazing, rugged, dense, unforgiving wilderness, (2) glaciers, all 300+ of them, and (3) hydroelectricity. Yep, there are three dams in the park established and maintained by Seattle City Light. These obviously predate the creation of the park. The one and only paved road, Washington Highway 20, that winds through the park follows the valley floor through most of the park where the dams and river/lakes are found. There is no road that leads to stunning vistas of glaciers or panoramas of the mountain ranges. 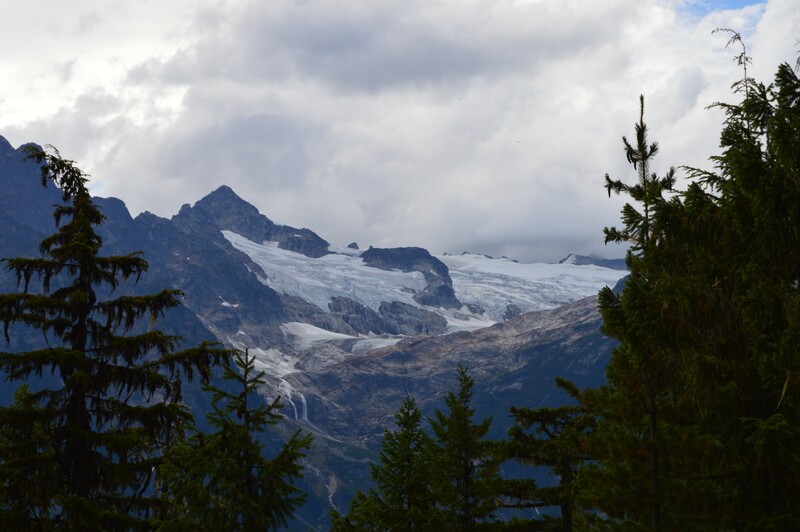 In fact, you can see only one glacier from Highway 20, if you know where to look, the weather is perfect, and you squint real hard. Think of it as the opposite of the famous Going to the Sun Road at Glacier NP. 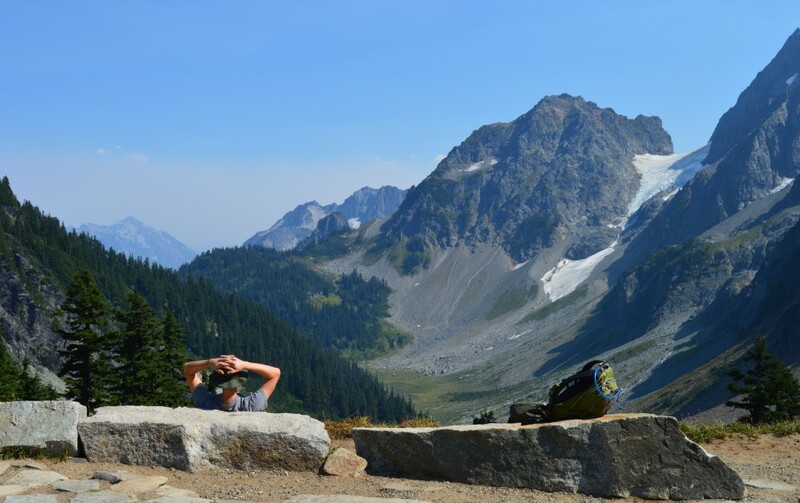 This is the beautiful and frustrating thing about North Cascades. It is absolutely stunning, but to see it you’ve got to hike. And the hiking here is hard. Many trails start below 1,000 feet and gain 500-1,000 feet per mile. 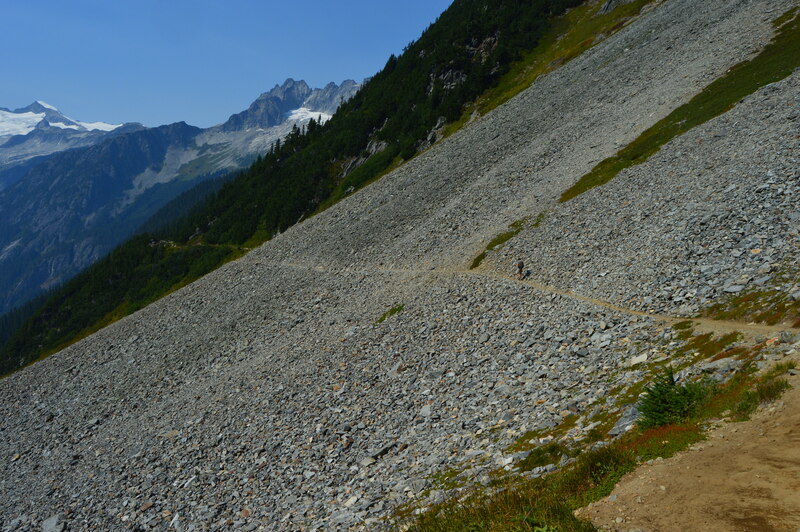 These trails will make you think your heart will pound out of your chest on the way up and your knees will shatter on the way down. 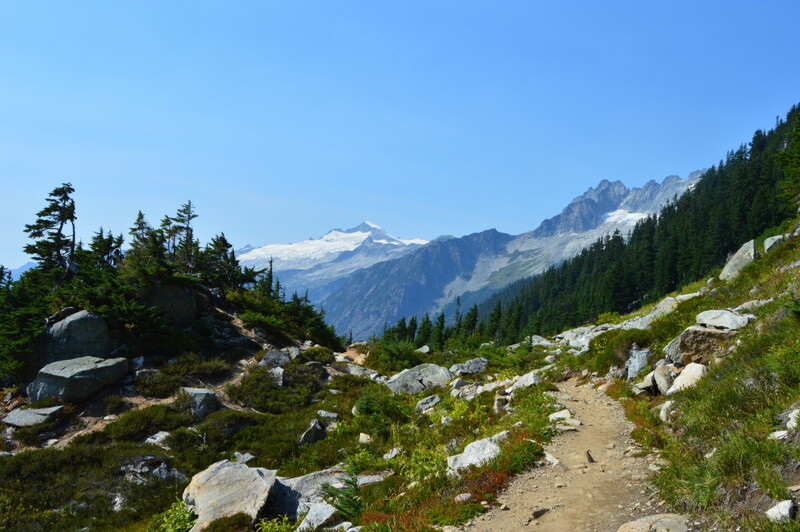 We prided ourselves on being in good hiking shape before arriving at North Cascades and we were thoroughly humbled by the hiking there. It’s also the first park we felt truly disadvantaged by not having overnight backpacking gear with us. To see the best of what the park has to offer, you need a minimum of 2-4 nights in the back country. 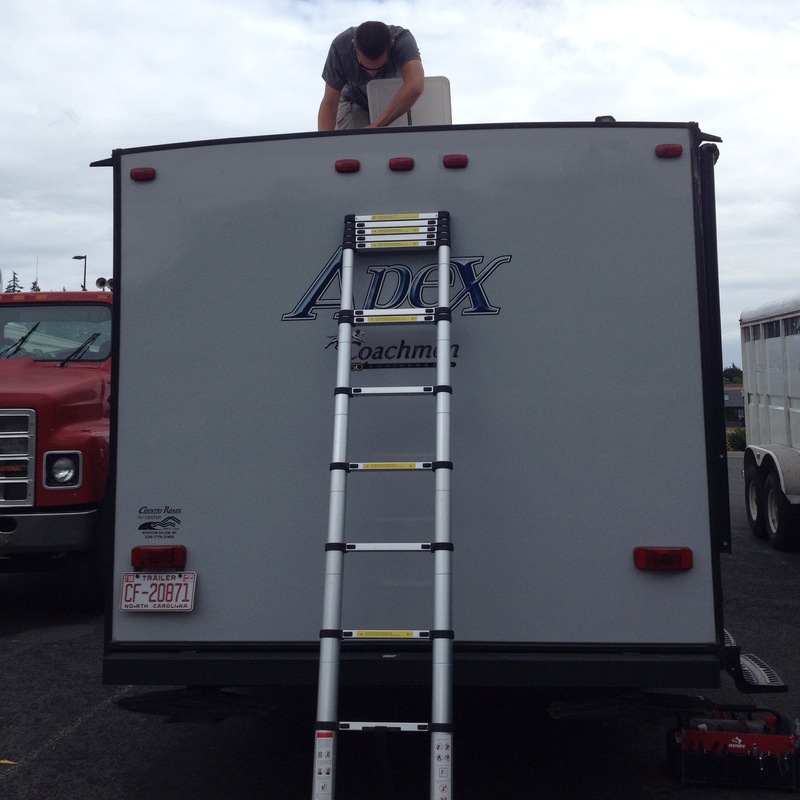 We simply can’t do that with the equipment we have with us. Next time. 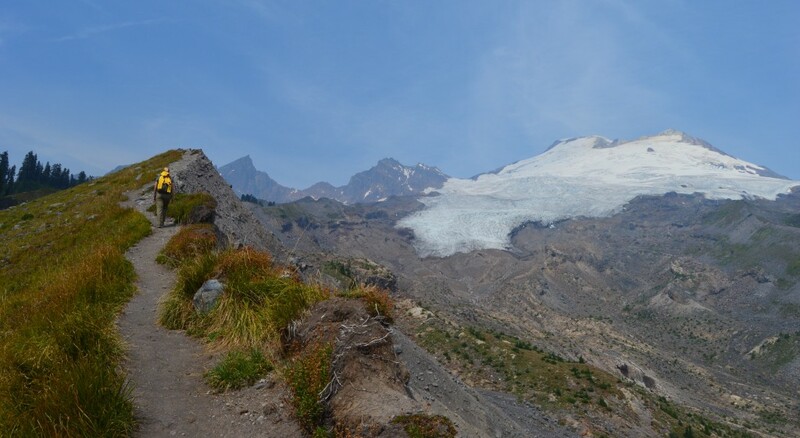 While in the park, we had the opportunity to camp in two separate campgrounds (one of them totally free and lakeside), complete one tough 10-mile hike, take in a lovely 7.5 mile hike to Cascade Pass, and enjoy several smaller hikes. We saw the strangest “park film” of the year (we’ve seen about 14 of them). We took an official tour of one of the small towns built to service the dams and took an unofficial tour of another one of these towns that is about 70% abandoned and looks like the set of the “Walking Dead”. At dusk it’s downright creepy. We also marveled at how few people were in the park. At times it felt like we had the entire park to ourselves. Having your own national park is a pretty special thing. We just wish that the smoke hadn’t driven us out earlier than expected. *We’ve observed that hitchhikers are more common in and around the national parks than most places in the US. In fact, we had to hitch a ride ourselves while at Arches NP. While in Glacier NP, we picked up a man and his backpack. At least it appeared to be a backpack from afar. In reality it was his two year-old daughter in a child carrying contraption meant to work like a backpack. He and the rest of his family had missed the last bus back to their campground and weren’t prepared to hike seven miles back to camp with a gaggle of young children in tow, so here he was catching a ride with us back to camp to get the car and pick up the rest.